Most of us know that the fashion industry is a major polluter. It’s regularly quoted as being ‘the second most polluting industry in the world, second only to oil’, but as I’ve failed to find a single, verifiable source for that oft-repeated nugget of information, I won’t be citing it here. However, whether it’s second, tenth or fiftieth, no one is arguing that fashion, as an industry, is a huge polluter and a vacuum for non-renewable resources. According to the recently published report from the Ellen Macarthur Foundation, “total greenhouse gas emissions from textiles production, at 1.2 billion tonnes annually, are more than those of all international flights and maritime shipping combined.” As an isolated issue, that would be damaging enough, but it’s just one in an entire catalogue. 93 billion cubic metres of water is used annually, often in water-scarce areas; poisonous and carcinogenic pesticides and fertilisers are sprayed over cotton crops; toxic dyes are leeched out into freshwater sources; thousands upon thousands of garments are burned to make way for new season stock; less than 1% of material used is recycled; this list could go on and on. We’re increasingly aware of the impact of production but what happens once those clothes are hanging in our own wardrobes? What impact do they have then? A pretty big one, it turns out. In fact, 25% of the carbon footprint of clothes comes from the way we care for them. That’s an enormous opportunity for us a individuals to reduce their impact. While tackling the industry – with its convoluted supply chains, ever-hastening production and linear, globalised structure – is a mammoth task that needs tackling from all sides (consumer, industry and government), reducing the impact of the clothes we already own can be surprisingly easy. The smallest changes in habits can collectively make a huge difference. I distinctly remember the first time I thought I might be a bit gross for not washing my clothes every time I wear them. I was having a conversation with some colleagues at a summer job I had while I was a student and the topic came up. Someone said, “Yeah but obviously you don’t wear something twice!” and before I could lightheartedly disagree, the whole group concurred and grimaced at the thought of doing so. I shrank back in my seat and wondered if I was some kind of disgusting troll who knew naught about the social intricacies of clothes washing. Turns out, though, I’ve actually been saving the planet this whole time. So, emboldened by facts, I will release the shackles of embarrassment and declare: I don’t wash my clothes every time I wear them! And neither should you. Washing comes second only to extraction in having the biggest impact in the life cycle garments in the UK. By extraction I mean the production of the fibre that makes a fabric, whether that’s cotton or a synthetic polymer. Given that we know how resource intensive that is, that washing is next line in terms of carbon emissions is shocking. Instead of throwing them in the washing basket, hang your clothes up to air them out and get more wear out of them between washes. You’ll save on laundry and your clothes will last longer too. Switching from 40 to 30 degrees when you wash can save up to 60% of the energy consumption. The number on the care label isn’t the suggested temperature, rather the maximum temperature at which you can wash a garment without damage, so dipping below it isn’t risky. As well as coming out perfectly clean, the lifespan of your clothes will be considerably extended. If you stick your clothes in the tumble dryer after you’ve washed them, your carbon footprint will increase fourfold and, if you’re using a combination washer-dryer, you can make that just under six times the impact. I know that wrapping yourself in a fluffy, tumble drier-fresh towel is about as close as you can get to actual heaven on earth, but it accounts for 75% of the carbon footprint. Do the planet a favour and let it dry on the washing line instead. Dry cleaning isn’t dry at all. Clothes are generally soaked in a solvent called tetrachloroethylene, also known as perchloroethylene or ‘perc’, and perc isn’t very nice at all. It’s neurotoxic and carcinogenic and studies have showed that living near a dry cleaner that uses perc increases the risk of developing kidney cancer. Additionally, studies of dry cleaning workers exposed to perc have shown associations between exposure and both bladder cancer and Hodgkin lymphoma. It’s also been linked to liver damage, confusion, dizziness and irritation of the skin and respiratory system. In environmental terms, spills or accidental release allow perc to evaporate into the air, absorb into soil and silt and dissolve into the groundwater. Incidentally, exposure through these sources is thought even more dangerous. 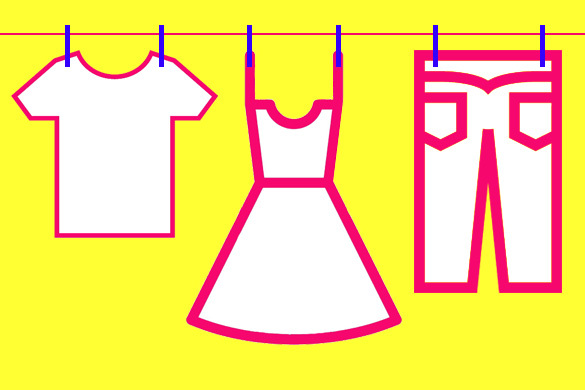 Apparently, one in three of us avoid buying dry clean only garments anyway, but if you have them, most can be washed on a gentle cycle in modern washing machines. If you daren’t risk it, take a look at GreenEarth dry cleaning as an alternative. The rise of fast fashion has swelled our wardrobes and slashed the average lifespan of clothes. Estimates show that over half of fast fashion is disposed of in under a year and we now know that the average number of times a garment is worn before it’s discarded has dropped by 36% in the last 15 years. Not only are we wasting money, but we’re wasting resources. If we were to extend the average life of clothes by three months (per item), we’d benefit from a 5-10% reduction in carbon, water and waste footprints. Extend it to nine months and those figures increase to 20-30%. In terms of tasks, simply wearing your own clothes couldn’t be any easier yet the benefits are tangible. I’ll never believe that protecting the environment is down to consumers alone. It needs intervention at a governmental level in order for sanctions to be applied for for greener processes to become not just the most appealing option, but the only option. Until that happens, however, we can continue to fight the battle on both an individual and a collective level. These tips are weapons in our armoury. Let’s use them.